The Mary Meeker KPCB internet trends report is one of the most read slide decks in the world. Every year Ms. Meeker covers the most notable stats and trends in tech. In our first post we covered the most important takeaways from her recent report. In this post we’ll highlight key points from the section covering e-commerce. Chewy.com – A mix of strong user community and high customer satisfaction led to strong revenue growth. The company was recently acquired by PetSmart for $3.35 billion. Glossier – A mix of user generated content and home created content. Engaging with user content as a source of brand love, loyalty, and evangelism. Untuckit – Connecting online and offline brand experiences to create a feedback loop. Active dialogue with customers = happier customers, better merchandising, and engagement growth. AllBirds – Product focus and simple website experience. Less is more. Trendyol – An e-commerce apparel brand serving the Middle East. Combining private label and local sourcing to achieve short lead times and low pricing. Over 1,000 of Trendyol’s suppliers are within about 30 miles of its headquarters. MM LaFleur. 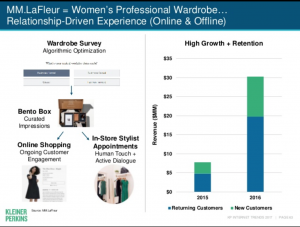 An apparel brand targeting professional women with a combination of offline and online experiences, including stylist appointments at the store (a perfect use case for texting). Relationship driven shopping at its best. Texts are personal and intimate. They are like chatting with a friend or family member. Social media is great for one to many conversations, texting is more personal. Texts are a scalable way for brands to create a personal touch because tools like OwnerListens now exist to enable multiple responders, templates, auto replies, and more. Most importantly, as more and more data is collected, we can use AI to automate or semi-automate responding with chatbots. What can your brand do to create an active dialogue? How can texting help you do it? This collection of “E-commerce Ahas” (as Ms. Meeker called them) illustrates how fast e-commerce is growing and evolving. Packages and parcel growth is accelerating (9% increase year over year). This is driven by the growth of online shopping. E-commerce growth is accelerating in the US. Up 15% Y/Y. Unwrapping boxes is now entertainment. The top 5 Unboxing channels on YouTube have 33 million subscribers. That’s more followers than Donald Trump has on Twitter (including bots). Remember WebVan? The grocery delivery service from the late nineties burned through over $800 million dollars before going bankrupt in 2001. Grocery delivery startups were a no-go for a long time following that failure. Today, personalization of grocery shopping is increasingly being done online. Meeker gave the example of Instacart prompting people to repeat a purchase they made in the past and algorithmically suggesting replacements when an item is unavailable. There are other examples like Amazon Fresh and Good Eggs to name a few. Personalization of apparel using algorithmic attributes, data science, and customer feedback. 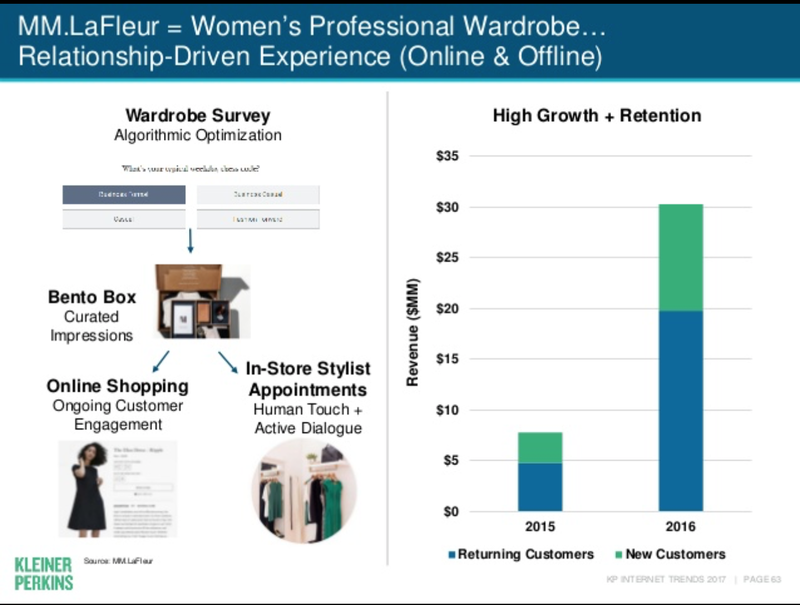 StitchFix is using this combination to create a private label. Digital native brands like Amazon going offline and opening retail locations while traditional brick and mortars are closing at record rates. Examples include Warby Parker and Bonobos that are focusing on personalized retail experiences. Again, the theme of active dialogue with customers emerges. We love this quote by the co-CEO of Warby Parker Neil Blumenthal: “I don’t think retail is dead. Mediocre retail experiences are dead.” We think the same is true online. The bar keeps rising. Walmart is seeing the writing on the wall and investing heavily in online commerce. In the first half of 2017, it made four substantial e-commerce acquisitions and investments: Modcloth, Moosjaw, JD.com, and Shoebuy. Amazon’s private label is the leading provider of batteries in the US. Not just online – in all channels! It’s #3 in baby wipes (beating Costco by 10%). Subscriptions. Amazon now has a store for monthly subscriptions. This trend makes more sense for retailers selling a recurring or ongoing service and for those selling products that need replenishments. This trend reminded us of Orglamix, an organic cosmetics retailer that uses Message Mate. Orglamix offers a subscription box which is a great source of recurring revenue. It’s cheaper to market to an existing customer than to get a new one (and texting can help you send reminders to existing shoppers using our Zapier integration). We’re sure you noticed a recurring name in this list: Amazon. The biggest player in e-commerce, the elephant in the room everyone is afraid of. But Amazon will not capture the entire e-commerce market. The reason is in another recurring theme mentioned above: personalization. To us, personalization is not just algorithms suggesting what you should buy. It’s not just reminders to replenish your paper towels, it’s about personality. Creating a brand customers feel a personal connection to coupled with a unique product offering is a sustainable differentiator. Amazon will never feel personal but brands like OwnerListens customers Man Crates, Orglamix, Langsura, and Nuclear Blast Records always will!